We have purchsed three used Toyota Priuses, starting in 2007. I would say simply have it checked by a reputable mechanic, and buy without any concern. All of our Priuses have been nearly flawless. They are so reliable that you can't go wrong. I also recommend that you buy the regular Prius, not the Prius V. There is only slightly more cargo space in the V, and the fuel mileage is much lower with the V. We are regularly amazed at how much can be fit in our Prius. For long trips driving across the country, camping, we simply put a Yakima Skybox on top, together with our canoe. My brother bought a Prius at our recommendation, and a few months later his wife sold their minivan and bought a second Prius. They love them. What Jerry said! At 40K miles, it still has dealer warranty anyway. Just get it checked for anything major and then relax. These cars are incredibly reliable! Try not to kick yourself too hard for not buying one sooner! We have a 2005 Prius with 280K that has been very problem free. You will have much better luck going the private local owner via craigslist/autotrader, instead of the CPO since the quality of both will be the same but will save $$$ since the dealer CPO route. Would encourage you to get a car fax (accident free), with regular oil changes and good mechanic inspection to ensure your getting a good deal. (avoid out of state cars with accident history due to hurricane/flood issues). Summary of Prius's: 2004-2009 are the most bullet proof but are noiser interior due to smaller engine, with bladder gas tank which shrinks in cold weather, and a favored as taxi cabs. 2010-2015 have larger engine but don't seem as reliable with problem areas of headlights/brakes, more plastic interior parts but better gas mileage (we didn't care for the flying center console confinement). 2016 to present have better gas mileage and handling but don't care for the restyled exterior, described as many as fugly. If you are looking for better gas mileage and have access to an outlet, you might consider a used Chev Volt since we are averaging 95 mpg since 90% of our trips around town can be done in electric range. The 2018 Prius Prime is also plug in but the price premium, limitation to 4 seats and small electric range are keeping us waiting for the Tesla Model 3. Prius is a good safe choice but you will get spoiled if you get any vehicle with a plug since it is even more cost effective than the prius. Thank you so much for the responses! I just got word back from a dealer that the 2015 Prius CPO we wanted that has 45,000 miles is available now. Do you recommend still getting it checked out by a mechanic if it's CPO?? The prices of CPO toyotas reflect the additonal dealer inspection/prep. However, I have noticed quite a variance in attention to mechanical detail between Toyota dealers so it might be worth an independent inspection. However, for a more cost effective ownership experience I would encourage you to consider looking at the private party route since purchasing a 2010-2015 with the same (or higher mileage) will likely be priced 3-5 K less, and the ownership experience/reliability will be the same. (That is alot of gas/oil changes/tires). A quick check of CL in your area showed a good number of used private owner choices. The key is to find a private owner sale with a clean car fax (no accidents/regular oil changes) from an owner that has cared for the car as a member of the family ideally garaged and the interior looking like it came from the showroom. Good luck on the hunt but I would pass on the dealer CPO due to the bigger bang for buck private seller (your independent mechanic inspection will be 100-200 dollars instead of the 3-5 thousand Toyota dealer CPO). I agree with everyone so far, except that the Chevy Volt is not nearly as reliable as the Prius. Saying the 3rd gen is not as reliable as the 2nd gen is not saying much, as they are all reliable. I recommend going for a 2016 if you can afford one because it is a better car. The gen 4 styling is love it or hate it. I like it much more than all the previous gens. I recommend going with the regular Prius liftback, not the Prius v. The Prius v just gets worse MPGs and is even slower. We have persuaded three of our family members to buy a Prius and they all love them. I advise you to not buy a Plug-In Prius, because those were expensive and only give you a tiny EV range. The Prius Prime is good though. The Prius C is a reliable car, but otherwise is pretty bad and is based on the Toyota Yaris. We have owned two Prii: a 2005 with 250k miles and a fully loaded 2016 with 40k miles. Both bought new. I am actually buying a Mazda3 today to replace the 2005 Prius. It is at the end of its life. It has never had ANY problems until this year when the A/C broke three times and the HV battery (the big one) died. The total for repair costs this year was about $6,000. That is too much for me. Despite this, the car is amazing and you should only be worried about buying one if it had an accident or a bad CarFax. With normal maintenance, forget about going to the shop for repairs and paying a lot for gas. I'm still on my first set of brake pads in my 250k mile Prius. The engines are bullet proof, with the exception of some burning oil. My 2005 burned oil and now it doesn't for some reason. The 2010 is the most likely to burn oil. The 2015 should be the most reliable year of the Prius because it is the last year of that model, when Toyota has sorted out all the quirks and problems. The main problems with the 3rd gen are headlights that don't work (it has been a problem with gen 2 and 3) and oil consumption. The 2nd gen (2004-2009) was a revolutionary car. The 3rd gen (2010-2015) was less so, but still an excellent car that will last you for years. Some criticize the 3rd gen for feeling like a rental car with all the cheap plastics inside, but it is personal preference. The difference of the 1.5L and 1.8L from gen 2 to gen 3 (or gen 4 in my case) is huge. The 1.8L is much quieter and more efficient. The link you provided looks really good looking at the CarFax and would be a steal in my area. It is a trim Four with no option packages, which is a good trim because it comes with with JBL and SofTex seating. If you want fully loaded, the gen 3 has the trim Five, which includes bigger wheels, option packages that bring active safety features, and more. I don't think going CPO is worth it with a Toyota. Toyota builds excellent quality cars that rarely ever break down. I recommend getting everything inspected buy a mechanic. I'm going CPO with my son's Mazda3 because I've only owned one Mazda in the past. It was reliable, but it isn't a Toyota, so it probably won't be as reliable. Mazda's CPO program gives you a 7 year/100,000 warranty which is worth at least $1k for me. They sell quick, so go get it! I have owned a Prius since 2004 and found it to be the most trouble-free car I have owned in the past 40 years, I still haveit and its our daily driver so it gets used from everythng from grocery shopping to cross country treks (it has done severaal). I have also owned additional cars that I purcashed CPO at the same time. CPO advantage i sthat althought it costs slightly more, the dealership has done its own inspection and applied its own "warranty" to the vehicle. That warranty is usually very short and amounts to next to nothing because the factory warranty is still in effect (this menss that the dealer has nothig to lose). I still prefer to buy CPO cars because the factory warranty is still in effect. I then drive the car a lot to see if I can discover any issues, if not then they tirn out to be good cars that can be relied on. I perform a lot of daily drivig and on the weekends I drive as far as I can, to see if any issues pop up. Buying directly from a provate party is the riskiest way to purchase a car. You might save a few bucks if you negotiate them down and if you find a cheap mechanic to do an inspection for you, but keep in mind that the previous owner and that mechanic will not step up and fix the car for free if it has any issues, so that is an extremely high risk purchase method. What I do now is to nut a CPO that has as musc factory warraty on it as is possibe, usually I can find cars with one year left on the warranty. It gets harder to find them with two pr more years left on the factory warranty but its possible. These are the cars that are the safest to buy, especially if you do not have sufficianet mechanical background yourself to do part of teh inspection. If you do have some background, then do the usual checks for visible issues, leaks, rattles, etc. then plug in your OBD II scanner into the port on the car in question and see if it has anu codes to report. Write down the codes and look them up. Just because there is a code does not necesarriy mean there is a problem. 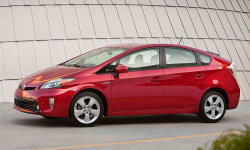 We have a 2010 Prius IV with 52,000 miles. It has been extremely reliable needing only new tires and routine maintenance--oil change, etc. The interior space is greater in volume than you might suspect. We rented a similar Prius before buying and set off for a Costco run. With the rear seats down, the car swallowed everything, including bulky paper goods. without a problem. The only downside for is that the gauges are difficult to read in bright sunlight. Another plus to owning a Prius is that you can join PriusChat, which is one of the largest and most loyal car forum websites. If you have questions or a problem, you can almost certainly get an answer there. Well, we got the car today! Ended up paying right at $15,600 for it, and I honestly feel like we got a great deal for the condition, age, mileage, and trim. I mean, heated leather seats?! I've never known such luxury before! And it is already so fun to drive! I'm not a car person by any means, but I find myself wanting to constantly read about it and check the display for my hybrid stats. I have a '16 Prius 2. The next generation Prius is so much better than the previous one. I have 55 + life time MPG over 25K miles now.It's quieter, peppy and it doesn't have that anoying flying bridge console thingy. Trunk doesn't have as much space but check one out if you can.